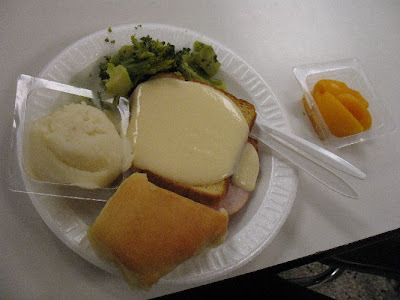 Contents: Open faced sandwich, mashed potatoes, broccoli, roll, peaches. Yeah. I've actually never had this for lunch. Great blog idea!!! I have a blog for Czechs and Slovaks living abroad (called the Czechmate Diary) and one of my readers linked to you. I am glad she did!